The Central African Republic is a landlocked country in Central Africa. It borders Chad in the north, Sudan in the east, the Republic of the Congo and the Democratic Republic of the Congo in the south, and Cameroon in the west. The former French colony of Ubangi-Shari became the Central African Republic upon independence in 1960. After three tumultuous decades of misrule - mostly by military governments - civilian rule was established in 1993 and lasted for one decade. President Ange-Felix PATASSE's civilian government was plagued by unrest, and in March 2003 he was deposed in a military coup led by General Francois BOZIZE, who established a transitional government. Though the government has the tacit support of civil society groups and the main parties, a wide field of candidates contested the municipal, legislative, and presidential elections held in March and May of 2005 in which General BOZIZE was affirmed as president. The government still does not fully control the countryside, where pockets of lawlessness persist. Unrest in neighboring nations, Chad, Sudan, and the DRC, continues to affect stability in the Central African Republic as well. 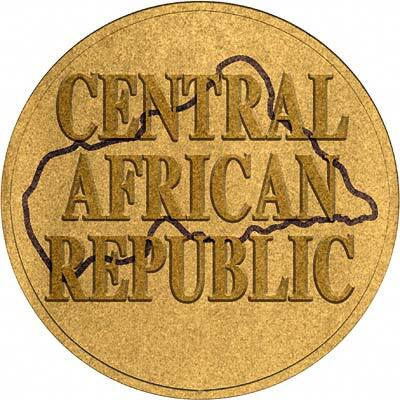 For silver and base metal coins of Central African Republic, please look at our original Chard Coins website. We make an active market in almost all world coins, gold or otherwise, including Central African Republic gold coins. If you have any of these coins to sell, please contact us, or post them to us for appraisal and offer.